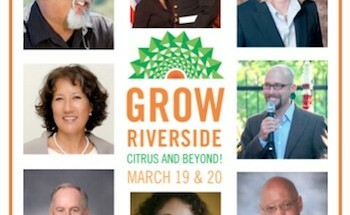 If you can’t grab your locally grown, farm fresh Riverside produce during normal daytime hours, don’t fret. There’s a new market in town, and it’s open after hours. This new night market, Magnolia Center Marketplace, is the brainchild of Rico and Rheiana Alderette, owners of downtown Riverside-based MADE, which sells furniture, vintage and handcrafted goods. MADE sponsors the market, which in addition to hosting a certified farmers’ market also features artisan and craft vendors. “A Friday night market is great for both consumers and farmers,” says Rico Alderette. 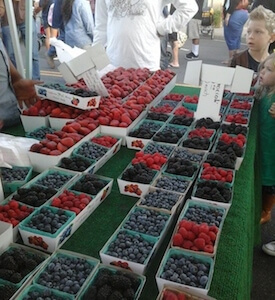 Kathi Foster, produce manager for the Friday evening (and morning) Riverside Certified Farmers’ Market, agrees. The night market is open from 6–9 p.m. every Friday, and if turnout at the inaugural event is any indication for the future, the new market looks poised to do well. Rico estimates that several thousand people were there for the grand opening. Foster, who was also present, says the large crowds didn’t hinder the event in any way. As far as details go, the Friday evening farmers’ market is not as large as its Friday morning counterpart, but includes many of the same Riverside area farmers and food-related businesses — from Gaytan Family Farm, Camlon Farm, Liskin Farms, Sea Wind Farms, Victor Farm, and Griffith Family Farms to Clemmons Farm, Muffin Top Bakery, and Jonas Raw Honey Company. Foster says it’s important to note that the new night market is an addition to the Friday morning market—it’s not taking its place, has no official relation to the morning event, and does not share the same space. The morning farmers’ market is located at 5621 Arlington Ave., southwest of downtown Riverside, while the night market takes place at the corner of Sunnyside Drive and Magnolia Avenue, just south of downtown. Foster gives credit to Rico and Rheiana Alderette for making the nighttime farmers’ market in Riverside a reality. Now that the night market has made its debut, Foster would like to see it evolve into something larger. 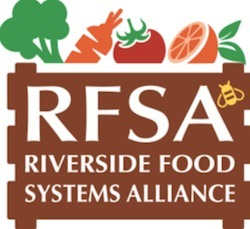 For Rico, the addition of a new nighttime farmers’ market in Riverside represents a positive step to reclaim Riverside’s agricultural past. Rico is pleased that the fledgling night market is now a reality, and he has a grand vision for its future.